The purpose of our weekly meetings is to develop friendships and strong ties among club members. Meetings also provide opportunities to help our members grow personally and professionally and enhance leadership skills. They also help us gain an understanding of community and international issues and how we might impact them. 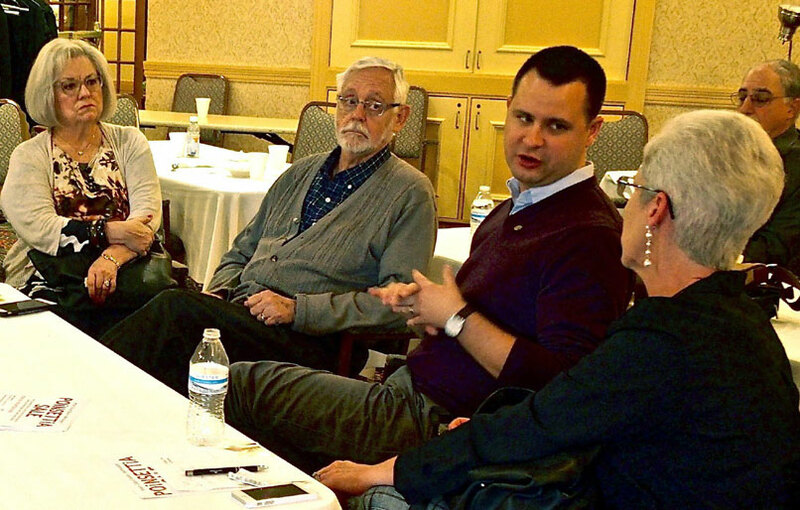 Most of our club meetings feature a presentation from an expert on a topic of interest to club members, such as current events and issues or needs in the Worthington and Dublin communities, in central Ohio, or in organizations that share common goals. We also invite representatives of local businesses to speak, and sometimes the speakers cover unique or fun topics. We also devote meeting time each quarter to engage our members in a local community service project. Visitors from other Rotary Clubs are always welcome. 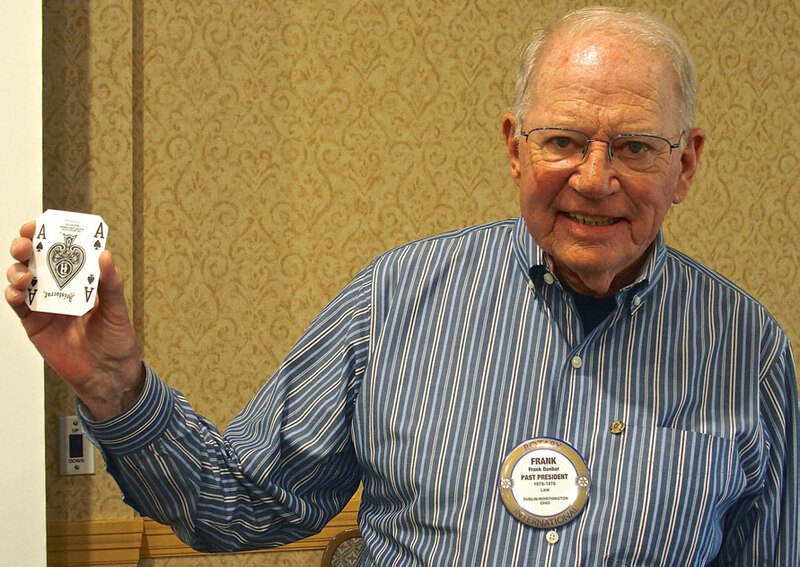 If you’e not a Rotarian, but want to learn more about Rotary and our club, please join us at a meeting as a guest. For more than 40 years our club met at noon for lunch. In 2017 we changed our meeting schedule format to a combination of breakfast and lunch meetings. The club meets on the first and second Wednesdays of the month for breakfast from 7:30 a.m. to 8:45 a.m. and on the third and fourth Wednesdays for lunch from noon to 1:15 p.m. This schedule is designed to address varying work and personal needs of our members. Because of work schedules or responsibilities, taking an extended lunch break is difficult for some members or potential members. The change also makes the meeting time more convenient for members who work in downtown Columbus or other areas of central Ohio. Now they can start their day at breakfast with club members and then head off to work. Most club members choose to eat, but dining is optional. And the cost of meals is very reasonable. The breakfast buffet is $8; the lunch buffet is $10. 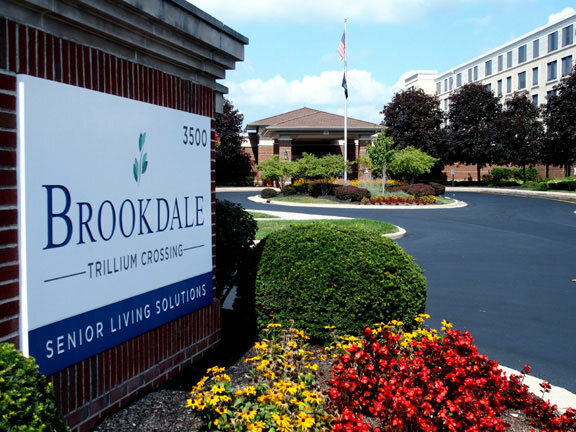 Brookdale Trillium Crossing is a senior-living community that provides upscale independent living and assisted living services for seniors. It is located at 3500 Trillium Crossing, Columbus, OH 43235, near the intersection of Sawmill Road and Dublin-Granville Road. The majority of residents live independently. Brookdale Trillium is known for its exceptional food, prepared by an executive chef, which is one of the reasons we chose Trillium for our meeting location. Whether a guest attends our morning or lunchtime meetings, the format is generally the same. There is a greeter and check-in table where you will be welcomed and invited to join us for our buffet breakfast or lunch. Hope You’re Not Ruffled by Our Raffle – Before you leave the check-in table, you will be invited to participate in our raffle (1 ticket for $1 or 3 for $2) for two drawings. The money raised is shared between the winners and the club. The club’s portion supports our social activities. Where’s the Action? – Fifteen minutes have passed, and nothing has happened yet. It’s okay. The beginning of the meeting is a time for members to catch up with each other and connect with new members, visiting Rotarians and guests. We normally start the formal portion of our meeting around 7:45 a.m. or 12:15 p.m. Going Back to School – After the bell rings, each meeting starts with the invocation. We stand up for the invocation and remain standing for the Pledge of Allegiance. Then we sit back down to finish eating and get ready for the rest of the meeting. Be our Guest – After everyone is seated, we will introduce you, Rotarians visiting from other clubs and any other guests. You are invited to say a few words if you wish. What’s Up? – Announcements and reminders will be made about club or community activities. Why Do We Need a Sergeantat-Arms? – Our Sergeant doesn’t keep order; in fact, sometimes he or she sometimes causes disorder. The Sergeant fines members, varying from $1 to $2, for making the news or celebrating a special event or doing something special for the club. It’s our way of recognizing members in a fun or humorous way. Members are also invited to contribute a Happy Dollar, sharing something that is making them happy in life. Sergeants may also pose a question related to the speaker’s topic or another subject to those at each table. If they fail, they’re fined. All of the contributions are used to support the club’s social activities. So we have some fun to generate more fun and fellowship. Speak Up! – Finally, our speaker. The topics of presenters vary from issues or needs facing our community to matters of state or national interest to subjects related to members’ work or interests. Sometimes they’re just for fun. Speakers usually talk for about 20 minutes with additional time for questions. Once each quarter we do a community service project during this part of the meeting. Will You Be a Winner? – After the speaker, the winning raffle tickets are drawn. Most participants are disappointed! Take Part in Our Test – At the end of the meeting we stand and recite the Four-Way Test, which is the ethical standard for Rotarians. A large banner displays the 24-word test so you can join us if you wish. Hope You Return – If you enjoyed your experience, then please come back and continue to get to know us and decide if this is an organization for you. Glendaly Rosario and her family face hardships living in a barrio of Santiago in the Dominican Republic. But Glendaly has hope for the future because she received a scholarship from our club to attend the Instituto Politecnico Industrial de Santiago. At the end of her four years in the program, Glendaly will have the skills needed to be employed in a good-paying job. Our club is helping youth in the Dominican Republic go from a life of assured unemployment and poverty to one of assured employment and self support. Are we making a difference? You be the judge.